Vladimir Nabokov admired Franz Kafka's novella, The Metamorphosis. Hence the lecture that Nabokov dedicated to the work here. But he also saw some small ways to wordsmith the story, or at least the English translation of it. 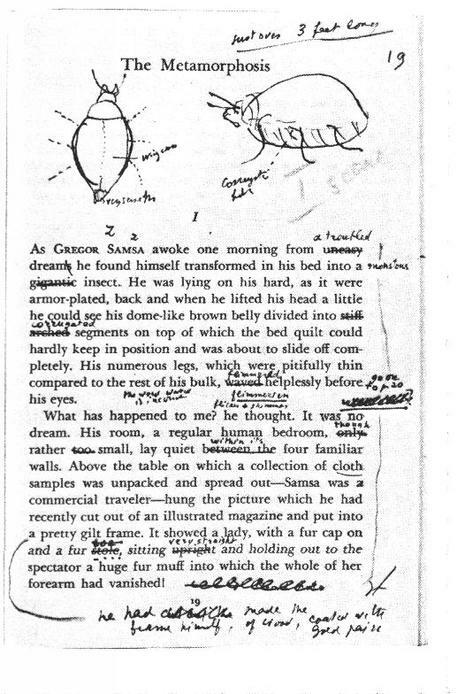 Above, we have some edits -- the nips and tucks -- that Nabokov scribbled on his personal copy of Kafka's most famous work. In 1989, Nabokov's lecture on The Metamorphosis was actually turned into a television production starring Christopher Plummer. You can watch The Metamorphosis - A Study: Nabokov on Kafka online. It runs 30 minutes. Of course, you can also download your own copy of Kafka's near perfect work of poetic imagination, to borrow a phrase from Elias Canetti. Visit our collections of Free eBooks and Free Audio Books. Good to see this posted! I use both the lecture and the 30 min. video in my classes. I think, though, that Nabokov was improving on the translation, rather than Kafka’s original German. Ich habe “Die Verwandlung” in Deutsch gelesen, und auch danach den kommentar von Nabokov. I found Nabokov’s commentary interesting. I found the short film with Christoper Plummer on Youtube and watched it with interest. He did a very good job of representing Nabokov. To add to the comment made by another on this site, I agree that he was only seeking to improve the English translation and not the original German. Often in the commentary Nabokov speaks of translators misunderstanding the original. Remember that although V N lived in Berlin for a while, his three best languages were Russian, English, and French.